When looking for St. Christopher medals for sale, it adds an extra layer of significance when you know the meaning behind it. This is a special style option. While this is a popular option for an accessory, it carries a lot of personal significance for the wearer. The meaning of the St. Christopher medal began as a Catholic notion, but has since spread to people of different religious backgrounds. The medal originates from worship of the figure of St. Christopher, a martyr that lived during the 3rd century during the times of the Roman Empire. One of the 14 Auxiliary Saints, Saint Christopher is the patron saint of all travelers. The name Christopher means Christ bearer in Greek, or one who carries Christ. One of the most famous and treasured stories about St. Christopher is the story of the child he found and then carried across a mighty river. The child in the story is later revealed to be Christ which is why this figure is the patron saint of travelers. Many people choose to wear a St. Christopher necklace during traveling for added protection. The Saint Christopher medal can also be placed in cars, purses, or suitcases, for those looking for the sense of protection without wearing the accessory. The medal typically depicts this patron saint of travelers as a large man with a child over his shoulder and a staff in his hand. The staff represents him as a protector against death during traveling. The medal will have different inscriptions on it based on the option chosen. For instance, the most common inscription in English is "St. Christopher Protect Us" or "St. Christopher Pray for Us." In French, the medal will say "Regarde St Christophe et va-t-en rassuré", which means "Look at St Christopher and go on reassured." It can also be translated as "Behold St Christopher and go your way in safety" depending on the accessory. In Spanish, the phrase "Si en San Cristóbal confías, de accidente no morirás" which translates to "If you trust St. Christopher, you won't die in an accident" is a common choice. Of course, the most popular choice is to wear it as a necklace or even a bracelet. 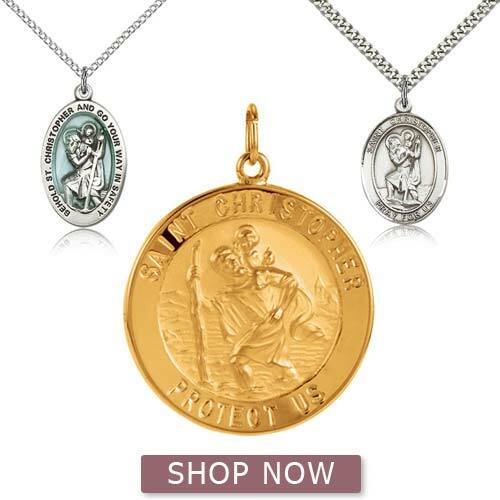 When choosing a Saint Christopher necklace or bracelet, there are options to choose from in a variety of metal tones, pendant sizes, and more. These items also make thoughtful gifts for a loved one going on a trip!